Animal Defenders International : Animals in entertainment : US Bill to ban wild animals in circuses introduced! 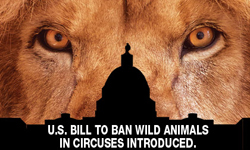 US Bill to ban wild animals in circuses introduced! Earlier this year, ADI rescued over 100 animals from circuses and the illegal wildlife trade in Peru and Colombia, including lions, bears, tigers, monkeys and others. ADI and the governments of Peru and Columbia collaborated for the unprecedented Operation Spirit of Freedom campaign; animals were rehabilitated at the ADI rescue center and rehomed in their natural habitats, with 33 African lions returned to their native Africa to start a new life at Emoya Big Cat Sanctuary, where ADI is funding construction of their habitats and their care. Support TEAPSPA, the bill that would secure a US wide ban.